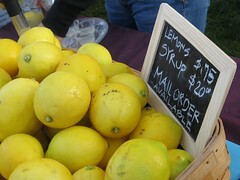 Just received a box of summer-ripe Meyer lemons and figs from a friend in California. Time for the perfect al fresco dinner, reminiscent of those years I spent in Rome when fragrant lemons from The Amalfi coast and soft Tuscan figs graced the open markets of summer. The menu? 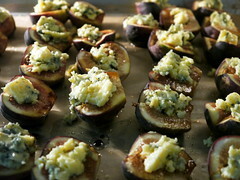 fresh, ripe figs with Dolce Latte Gorgonzola cheese and a drizzle of sweet, thick Balsamic Saba for dessert. A simple, quick celebration of summer. Fettuccine al Limone, serves 4-6. Add butter to a saucepan big enough to hold cooked pasta later. Melt 4 Tablespoons butter and add 1 cup cream. When it begins to boil, add 2 Tablespoons lemon juice and the grated peel from 4 lemons. Stir thoroughly, reducing the mixture by half. Turn off the heat. 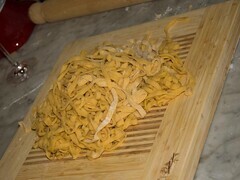 Cook 1 pound of egg fettuccine in a large pot of boiling, salted water. When cooked but firm (al dente), drain and toss in the lemon sauce for a few seconds to coat well. Add a little grated Parmesan and serve with a nice glass of Caprese or Sardinian white wine. 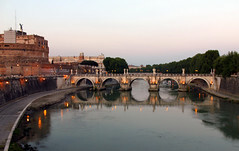 Close your eyes: You are summering in Roma! 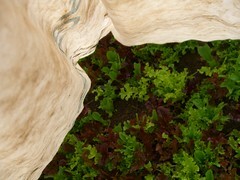 ~ by rfgainey on August 14, 2011.